Landscaping and garden clean-ups are one of the activities where a Lake Macquarie skip bin hire will be really useful and convenient. Cutting down overgrown branches in your garden or backyard can produce a huge amount of heavy waste. Even sweeping up the leaves after a windy day will give you a bulk of rubbish. Clearing out your garden and making it look beautiful once again is an enjoyable task especially if you already have everything you need. Lake Macquarie skip bins come in different sizes (from 2m3 to 30m3) and you can choose depending on the amount of your waste. Knowing what size skip bin you would need for this project is relatively easy as you can visually estimate the volume of the rubbish. Here, you can put all your garden wastes, such as leaves, weeds, bark, branches, and grass clippings. Take note though that a green waste and lumber skip bin is limited to these kinds of waste only. 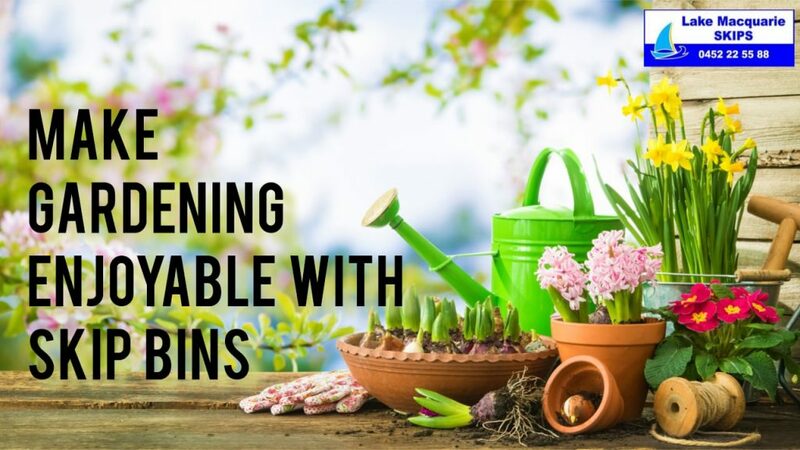 When gardening or landscaping, you may end up with a large amount of soil, stones, big rocks, concrete, clay, asphalt, sand, ceramic tiles, rubble and bricks you need to dispose of. These should not be mixed with your green and organic waste in the green waste and lumber skip bin. A major garden make-over may include getting rid of old fences, furniture, and decorations. If you do decide to put these in your skip bin, they can go along with your other household wastes like broken appliances, old toys and papers, metals or plastics, in the general waste skip bin. Lake Macquarie Skips helps you get rid of waste and ensure proper waste disposal and minimise waste products in order to fulfil our social responsibility of keeping the environment healthy. Some organic waste like food scraps, twigs, sticks, and bark may be a good ingredient for your garden compost instead of going into disposal. Where do I put my skip bin hire as I work on my garden? A mini skip bin works well for garden cleaning because it can easily fit in small spaces, like your garage, making it convenient to load and transport. While you work on your garden, you can keep your mini skip bins hire for as long you need, some additional charges after the first 7 days may apply. For larger loads like branches or tree trunks, your Lake Macquarie skip bin may not fit in your backyard. If you need to place your skip bin on a public land or council property, you will need a council permit from the Newcastle Council. This lasts for 28 days, for a cost of $82, and Lake Macquarie Skips will organise this on your behalf. Gardening should be a fun task as we work outside in the beauty of nature. Don’t let your waste materials get in the way. Contact Lake Macquarie Skips today and we would be happy to help you achieve that perfect garden as we assist in the proper disposal of your waste.